There has been so much going on these days, and all I’ve been craving is comfort food, like this delicious polpettone (Italian meatloaf). Polpettone, known as meatloaf in America, is made regions in Italy and in so many different ways. Before we get into some versions, I’ll tell you about the different polpette. You have polpette-beatballs; polpettine are really little meatballs (our Calabrian nonna makes an amazing soup with them). And finally, the polpettone, which is an actual meatloaf. But meatloaf in Italy is not like meatloaf in America. When my husband saw us making an American one with a ketchup sauce on top one time, he was in shock. He didn’t understand why it had to be so sweet when there were so many wonderful savory ways to make a meatloaf. I knew of some different savory versions, but I wanted him to try what you will find all around America. He prefers the savory version and my kids also love it. A polpettone is typically made free form and in some recipes it is cooked in a skillet on top of the stove. I like to bake mine in the oven. Polpettone in Italy, like many dishes, varies from region to region. In Tuscany you will find one made with carrots, onions, celery, prosciutto and cheese. If you travel to Emilia Romagna it will most likely be made with ground beef, pancetta and nutmeg. 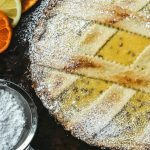 In Naples, you may find one made with raisins, pine nuts and marjoram. Around Rome, you may find a polpettone made with different ground meats and a tomato caper sauce. You may not be interested in the hard boiled egg part of the recipe. I usually have some hard boiled eggs on hand. Sometimes my kids want one as a quick snack after school. 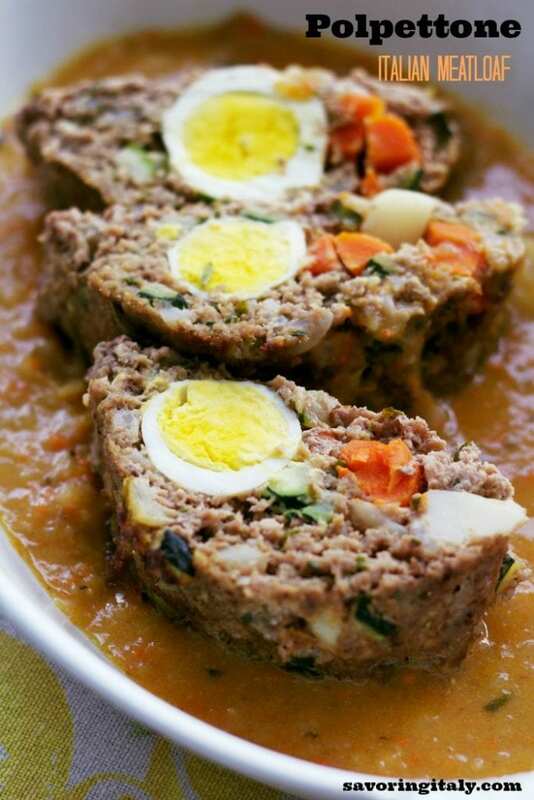 It looks so pretty when you slice the meatloaf and see the colorful egg. 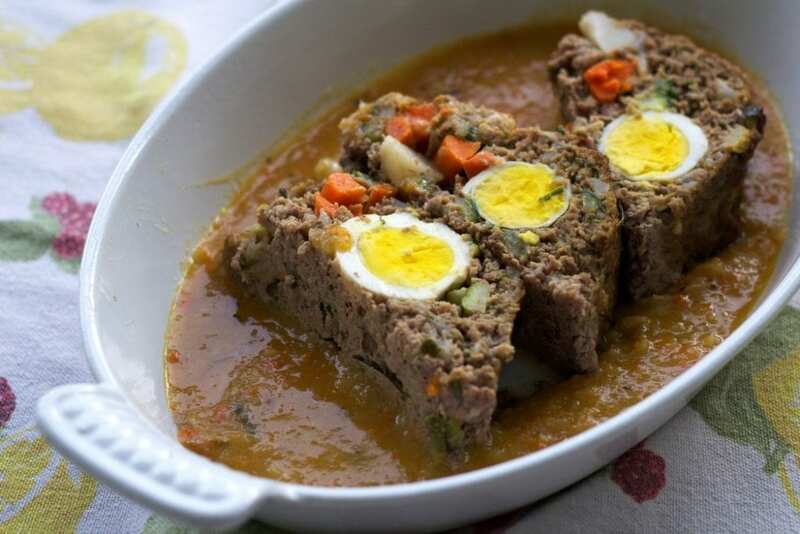 If you don’t want to do the egg part, you could leave it out and still have a delicious meatloaf. As I already mentioned, there are so many different ways to make your polpettone. There are so many Italian dishes with hard boiled eggs. I often make my mother-in-laws baked ziti with hard boiled eggs. I remember one time I made it and a friend was so excited. She couldn’t figure out what the egg was doing in the pasta dish, and soon she fell in love with it and would ask for it for any special occasion. 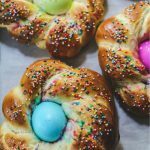 I also love the Easter breads with the hard boiled eggs like this one and this one. My mother-in-law sometimes stuffs hers with mortadella and provolone (so very good!!). While it’s cooking, add a little bit of water (or any broth if you have it on hand)if it seems to be getting dry around the vegetables. I had just made some butternut squash soup to have for the next day, so I used some of it in the sauce. If you don’t have any butternut squash or pumpkin soup on hand, you could use some water or any broth. Cut into thick slices to serve. We made some fluffy mashed potatoes to go along with our polpettone. Just as any other meatloaf, this polpettone is great for sandwiches the next day. 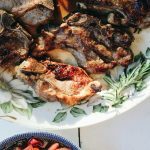 An Italian meatloaf that is wonderful to enjoy all year round with different versions. A delicious dish to enjoy when you are craving Italian comfort food. In a small pot of boiling water, boil the carrots, zucchini and potatoes. The zucchini will be finished before the other vegetables. Remove the zucchini when it’s tender and set aside in a small bowl. Boil the carrots and potatoes until tender. Remove and set aside in a small bowl. In a medium sized bowl, stir together the ground meat, parsley, rosemary, breadcrumbs, chopped onion. Add in the zucchini and one of the potatoes. Add in the eggs, cheese, salt, pepper and rosemary and stir until combined. Line a baking sheet with aluminum foil. Scoop out 1/2 of the meatloaf mixture and pat it into a rectangle about 9 inches long by 4 inches wide. 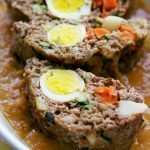 Line the hard-boiled eggs in the center of the meatloaf. Line up the one of the carrots cut into slivers next to the eggs. With your hands add on the rest of the meatloaf mixture and pat it on top covering the eggs. 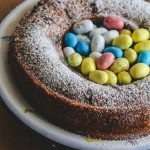 Make sure no parts of the eggs are peaking out. Place the rest of the potatoes, carrots and onions around the meat loaf in the pan. Add the wine around the pan and drizzle the olive oil on the meatloaf and around the vegetables. Bake for 35-40 minutes in the center rack of the oven (until internal temperature is 150 degrees), basting occasionally with the pan juices. Remove the dish from the oven. Transfer the meat loaf to a cutting board, and let it rest for at least 15 minutes. Puree with an immersion blender (or in your blender)the vegetables that were in the pan and the juices. I had just made pumpkin soup that day and a added about a 1/4 cup of the soup to the juices from the pan to blend all together. If you don’t have any pumpkin soup on hand, you could add broth or even a little water. Heat the sauce on medium-low before serving. Cut into thick slices. Arrange on a serving plate with the sauce on the bottom and serve with mashed potatoes. Look at all those treats INSIDE the meatloaf. Love this version, so much. What a gorgeous and unique (to me!) meatloaf! My family adores meatloafs of all kinds, so we've gotta try this sometime soon. Something tells me that my husband, my child and me will all adore this more savory version! 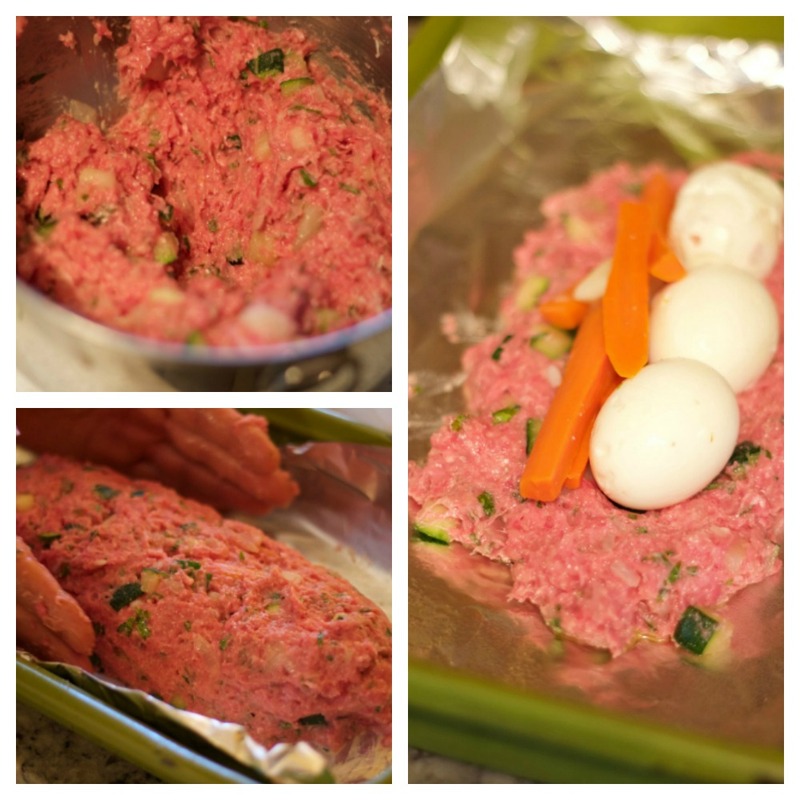 I agree with your husband – there's so many ways to make savory meatloaf! This looks like a great one to try! This is one gorgeous meatloaf! Can't wait to try it! 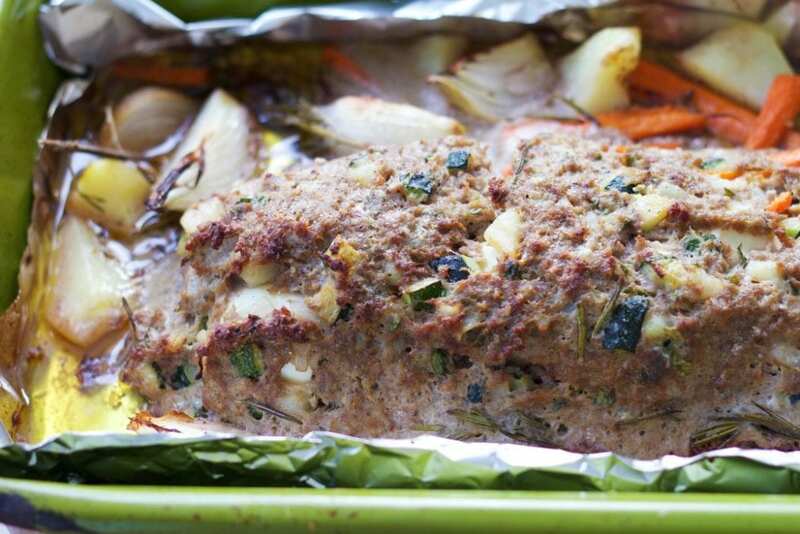 I love how versatile meatloaf is – this looks so good. I love seeing the hard boiled eggs in it. Great idea! I love italian polpettone. I do it often. It is easy and delicious! I will try your recipe too. I never knew that there were more types of meatloaf. haha I mean I guess I might have but if I did I forgot. I love this version though! 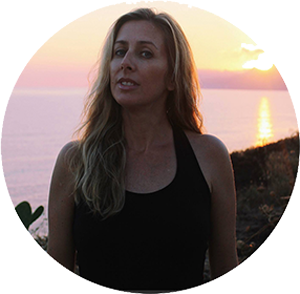 Lora, this looks amazing! I'll be making this either later this evening or tomorrow afternoon. It appears the carrots were left off the ingredient list…I'm guessing three (2 for the sauce and 1 for wrapping)?